Perhaps the most important development event we support each year is the Spinal Unit Games and this year’s has been no exception. 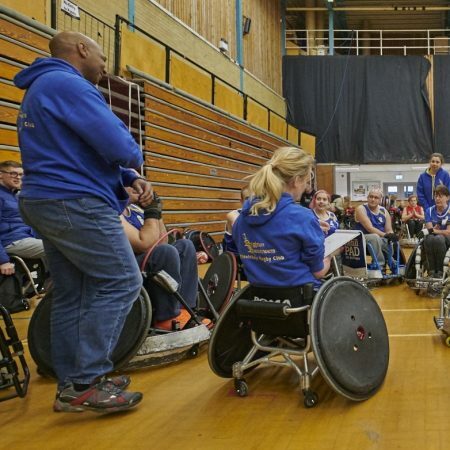 On Tuesday we were at Stoke Mandeville to introduce the games to 117 adults from all over the UK who have recently encountered life changing injuries which have resulted in various degrees of paralysis. 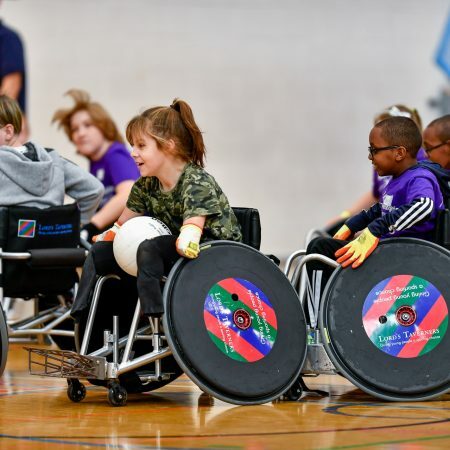 The games are an important part of their rehabilitation as they discover not just wheelchair rugby, but over 20 sports and activities. The Games are also an opportunity for us to encourage individuals to join our wheelchair rugby communities. Whilst some will be attracted to play the game and find a club soon after their injury, there will be others who will not be quite ready for that commitment but may seek the sport out at a later time. 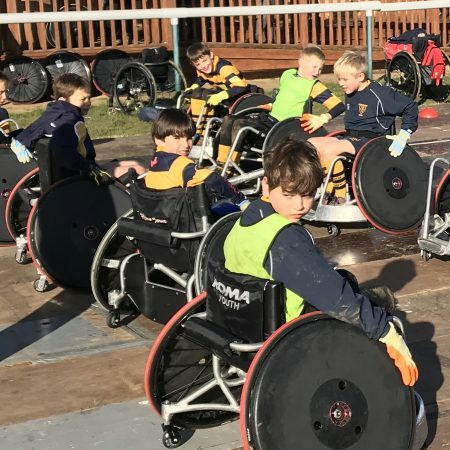 There will be another group who decide that wheelchair rugby is not for them but we hope they will find another sport which will suit them better. 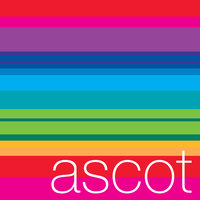 From experience our Members know what can be achieved by taking part in sport. It’s not just the excitement of competition, it’s also the confidence which comes from living an independent lifestyle and discovering the health benefits – even more important when you are a chair user. The Games also remind us of the importance of maintaining our focus on the core disability group for which our sport was originally invented; it started out as a game for those who had incurred spinal injuries and who did not have the functionality to take part in other disabled team games, such as wheelchair basketball. 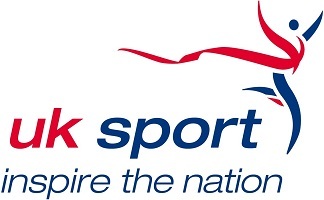 We know that the Paralympic discipline has moved on to embrace other disability groups whilst maintaining its strict classification criteria but we will always seek to search out those who have incurred spinal injuries to ensure we give them the opportunity to play the sport that is their heritage. 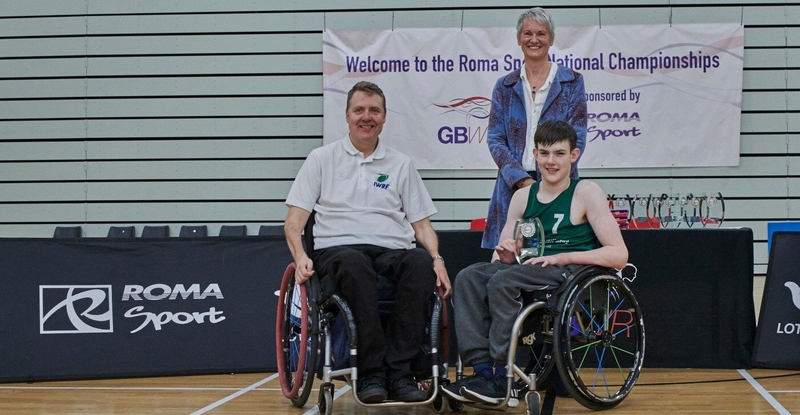 Last weekend I was able to catch up with many of you at the Roma Sport National Championships in Leicester. It was good to return to the Morningside Arena which is a great venue for the club championships as well as the international events we have held there. As always it was a great weekend and a fantastic demonstration of how far our sport has come. The results of the Cup also showed how close the top teams are with Storm, Tigers and Crash all finishing the tournament with 10 points each, but Storm taking the trophy on goal difference. In the Shield it was Burn who took the silverware with RGC close behind. In fact the games between these two were pretty exciting with RGC just clipping Burn by one point – 49-48 in their first game and Burn taking RGC 37-35 in the second. Saturday’s game between Hawks and Yorkshire was the promotion / relegation match and a Yorkshire win means that they remain in Division 1 next season. There were some familiar names who picked up the awards but it was especially good to see athletes like Faye West and Tom Baines, who have come through our development system, win personal awards. 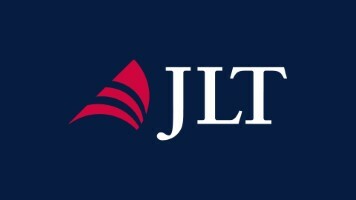 Congratulations to all the 11 teams who took part and thank you to Lee Stutely who organized this event for the last time this cycle as she now becomes the GB Team Manager on a full time basis as we build up to Tokyo 2020. In recognition of her outstanding work in supporting the Super Series and the Nationals the teams gave her a gift and made her the tournament MVP. A big thank you to all the volunteers, officials and classifiers who supported the event and to Trustee Mary Daunt and IWRF President Richard Allcroft for presenting the prizes. Amongst the spectators watching it was a pleasure to meet Keith Haydon and his family who have no particular connection with wheelchair rugby other than they love watching the game. 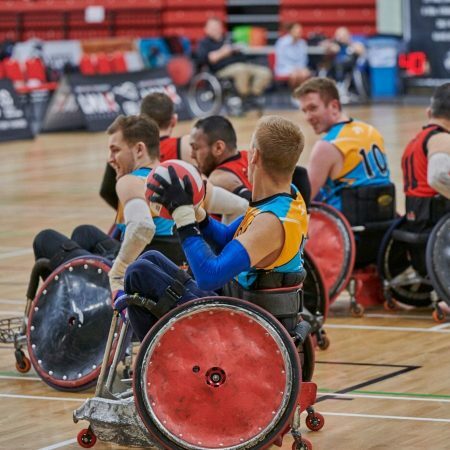 He commented to me that, ‘Wheelchair rugby’s great to watch and we’re glad to support it, especially as it doesn’t often get the coverage it deserves’. The family attended the first King Power Quad Nations and were disappointed that they had already planned to be away when the dates of this year’s Quads were announced. 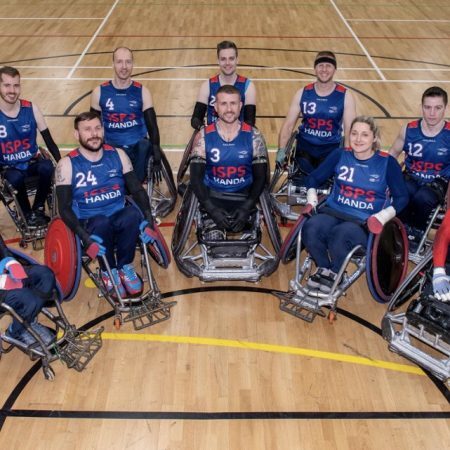 They were at Rio and are keen to be in Japan supporting us – so Keith and your family – welcome to the wheelchair rugby family! Yesterday along with some of the GB team I attended a fundraising event at the spectacular West Wycombe Estate, home of Sir Edward Dashwood Bt and his family. 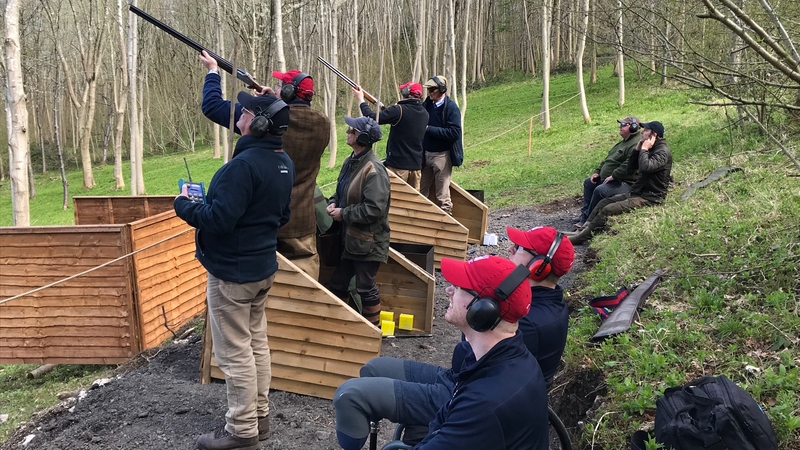 Sir Edward very generously allowed his family rooms to be used to host lunch and the private grounds to be used for a clay shoot which was run by George Digweed MBE and E.J. Churchill. George is a clay shooting champion with 26 world titles and was the first man to shoot 100 straight in a World Championship. He is regarded as the greatest clay shot ever – anywhere in the world! Watch him on YouTube shoot balloons from his hip! A number of teams took part for a fee which was given to GBWR along with other donations. 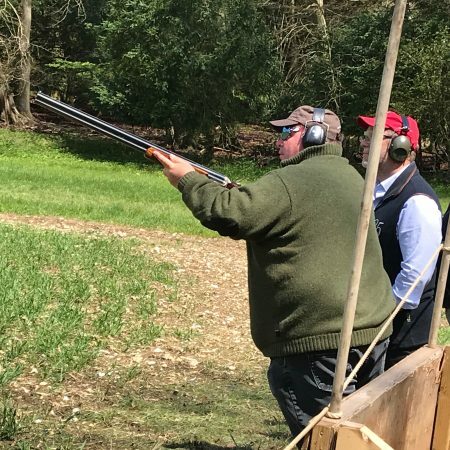 Our Patron Jason Leonard also took part and supported the hosting of teams and Aaron Phipps and Jim Roberts both shot in the competition. It was an amazing day and I am hugely grateful not only to George and Sir Edward but also to the many people and organisations who supported it – the teams who took part, E.J. Churchill for their amazing organization and wonderful lunch and hospitality, Gamebore who provided all of the cartridges and to Roger and Heather Alwen and Kate, George’s wife, who did so much to pull it all together. 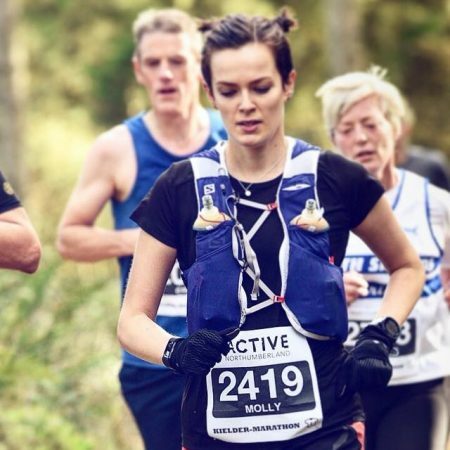 The above event is an example of the many different things we are trying to do to diversify our funding streams and to increase our income so that we can support not just the GB team but our other activities. I share the concern that many have about our competition structure which because of our success in growing it has now become expensive and challenging to manage. 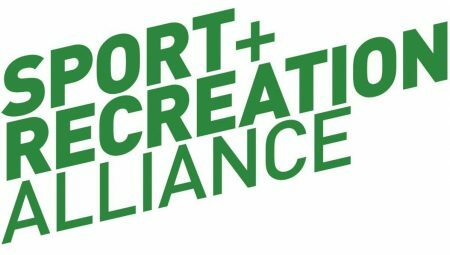 We are committed to continuing our efforts to find new sponsors and new ways of fundraising and this is now core business and as such an ongoing task which we all have to do if we are to maintain the growth and the quality of our sport. I have just commissioned Martyn Salt, who is a very experienced event organizer who many of you will know, to review our whole competition structure and to see what options there may be to ensure we continue to offer an affordable, competitive and enjoyable competition series. He will be speaking to clubs over the coming weeks to hear your views and ideas. Best wishes for a happy Easter and good luck to the teams taking part in the Bernd Best Tournament this weekend.